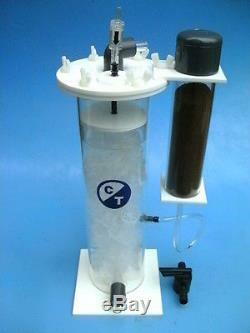 Ozone Reactor O1502 (150gals/ 660l). The Ozone reactor works by mixing the water and ozone in a reactor... Using the wet and dry method, with reverse flow to allow greater contact time between water and ozone. The O1502 should be situated above the water level of the aquarium or sump water. The O1502 comes with valve x 2, carbon reactor and carbon media. O1502 Hosetails : Inlet 12mm and Outlet 20mm. Base footprint :135 x 135 mm. The item "Ozone Reactor O1502 (660l)" is in sale since Wednesday, November 11, 2015. This item is in the category "Pet Supplies\Fish & Aquarium\Filters". The seller is "bosshogthemasterpig" and is located in Sleaford.